The next phase of the Metro parking fee program will be considered by the agency’s Board of Directors at their Dec. 1 meeting. The program began earlier this year when daily and monthly parking fees went into effect at three of the new Expo Line stations. •Expo Line: Expo/Bundy, Expo/Sepulveda, 17th/SMC and La Cienega/Jefferson. •Gold Line: APU/Citrus, Irwindale, Atlantic. •Red Line: Universal, North Hollywood. •Metro would also have the option to later add fees at the Green Line’s Norwalk, Lakewood and Aviation stations and El Monte Station. The goal is to implement the fees by April. The payment system will be automated and patrons will use their TAP cards to show they rode Metro. The idea behind the program is help Metro better manage its parking — and to ensure that parking is being used by Metro patrons and that some spaces remain available at any time of the day. When Metro doesn’t charge anything for parking, a lot of non-transit users end up using the space. The fees help discourage that from happening and help raise dollars needed to maintain the lots and keep them safe. The system will combine a License Plate Recognition (LPR) system, TAP card ridership identifier software, and payment processing solutions. On-site parking attendants will be available to provide customer service and technical support. Patrons will be able to pay on site, online or via a mobile payment solution. Payment will be accepted in the form of cash, credit cards or mobile payments transaction. The automated parking facilities will be available and accessible to transit patrons 24 hours a day and seven (7) days a week throughout the year. During non-peak hours when parking is available, without parking attendants on duty, customer assistance will be available via an intercom system that connects to a customer service center. The customer service center is available 24 hours a day and seven (7) days a week throughout the year. For those patrons that leave the parking facility with an outstanding transaction, the parking fee will be billed through the DMV record together with an administration fee. How We Roll, Nov. 16: catching up is hard to do! Hmm. 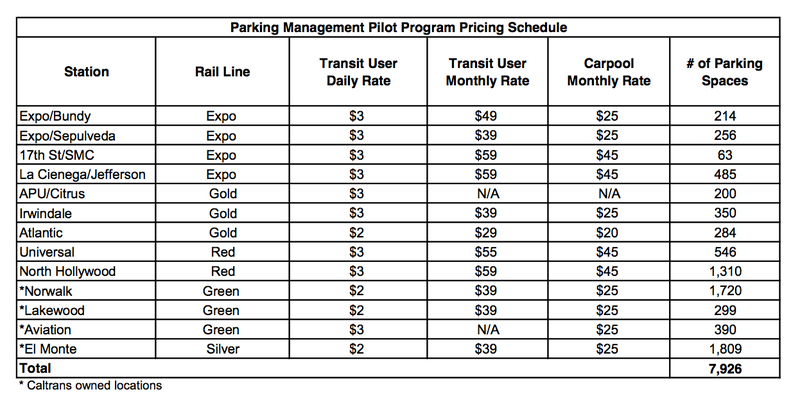 I would not be thrilled at the prospect of parking fees coming to the Wardlow Station, but if they were in line with the fees described above, then the combined parking and fares would still work out to less than the cheapest Hollywood Bowl, Disney Hall, Exposition Park, or Hancock Park parking, and that’s not counting the expensive gasoline I wouldn’t be turning into smog and greenhouse gases. El Monte station on the Green Line??? Whoops. Good catch. Fixed. Thank you! The La Cienega/Jefferson garage is almost never full. Please don’t start charging (except maybe during huge events like USC games). The cost would be prohibitive for short trips to many locations. Especially for students and others with low incomes. Most Culver City parking is going away with the development coming there. La Cienega will soon be impacted by that. The La Cienega park-and-ride lot is full today. I was there at 1:30 and every space was occupied. This lot is a prime candidate for the parking fee program. I park there every weekday and I welcome implementation of the parking fee. Aside from the need to reduce the subsidization of parking at Metro stations, the fee will give me a greater incentive to ride the bus or mike bike to the station. If you read the staff report, Metro will charge for parking 24/7, even on weekends and nights, using some automated system. No samples of the parking fee machines have been shown, and there are no standards for the customer service center, meaning that someone who has a problem with the machines could be standing there for hours on hold. Also, since it is automated, if you drive in you are charged, regardless of how long you stay. If you don’t pay at the machine, they send you a bill and attach $25.00 on top of it. And, some of the stations, like Atlantic, La Cienega, and El Monte, are not close to being full. So why charge for stations that are not near capacity? This will just lead people to park on the street surrounding stations, which is not going to make surrounding businesses and residents happy. Huh??? Either way they still be parking on the street…. Not during weekends and nights. Now they will park there to avoid the $3 fee. At most stations with free parking they park in the lot, even during peak hours. You don’t see much street parking around El Monte, for instance. I agree with James Lampert. If I recall correctly, the AAA (or some other group) calculated the average per mile cost of driving a car (including all costs) to be around fifty cents per mile. Currently the Metro fare of $3.50 buys ~1.2 gallons of gas. About 25 miles of driving in my vehicle. And my commute is double that. I’m saving $, having less stress, and the time delta of driving vs Metro is small. The price of driving excluding parking is roughly double the cost of the fuel consumed(larger vehicles cost more and use more gas). $.50 per mile seems about right for an economy car. A full sized SUV might be closer to $1 per mile with the average american car somewhere in between. Charge more at times of high demand and less at times of low demand. That’s what private lots do. At Atlantic the parking demand is strong on weekdays and weak on the weekend. Using a TAP card to pay for parking is a MUST. One card for all commuting purposes. That will allow people to use funds from employer sponsored transit savings accounts. That would not be allowed by the federal government as parking at transit stations is not considered transit use. Your SmarTrip® card will have three sections, or purses. The first purse will hold your benefit for transit fares only. The second purse will hold your benefit for Metro parking only. These benefits will not be transferrable from one purse to the other. The third (or personal stored value) purse will hold whatever additional amount you add to cover either transit or parking. These changes are being made to comply with IRS mandates to better control the allocation of transit and parking benefits. Thanks for all of that detail. This is even more robust than I had envisioned. Some employers give employees a monthly transit/parking stipend equal to the parking cost at their work site (or a monthly transit pass). If the employee drives, they pay for parking. If they commute via transit or vanpool, the stipend contributes to a monthly pass or fee. If the employee walks or bikes or carpools, they effectively pocket all or part of the money. This gives employees incentive to use alternates. My experience at the Green Line Aviation Station is that a large number (maybe not a majority) of parking spaces are used by airport employees. Who then use the Airport Green Line bus to get to work. Airport Green Line bus is free, but posts signs that riders must show a Metro transfer to board, which I don’t believe is enforced. I know when I’ve taken the Airport Green Line bus to get to the Aviation Station I am often hard-pressed to find a seat because of all the airport employees riding the bus. And now those Airport Employees will have to tape their TAP card for a metro trip once a week and pay $3 a day. Likely still cheaper than parking at LAX. I know a lot of Airport Employees do actually take the train to LAX. I see them every day on my commute to work at Douglas Station. There is literally no street parking anywhere near Citrus/APU because of Rosedale and the colleges. Adding mandatory $3 parking would be devastating to the poorer commuters. If this paid parking plan does go through, Metro needs to parcel out some temporary parking spaces and a pick-up/drop-off zone at Citrus/APU. It’s red curbs all around… and again, no street parking either. I have never had trouble finding parking at LaCienega/Jefferson – and that is at all hours. But especially nights and weekends, when it makes no sense to have to pay for parking. And for my commute, the additional fee will impact my ability to afford to take the train, let alone my willingness to do so. I think this is – as so many of the changes implemented – an idea that is full of unintended consequences that will adversely affect the ability for so many of us to use the train. And, especially for those of us who live too far, work nights, are seniors or who carry bags or cases for work, telling us to walk or bike to the train is simply not possible. Once again, a plan based on money and not on reality or practicality, and that has not had the bugs worked out first, will be tested on us in the worst possible way. If you read the staff report, if you get confused by the machine or signage, or just drive in the lot and drive off without paying the fee, you are dinged $25.00 as a service charge and the bill is sent to the registered address of your car. And what if you have problems with the payment machine? Will you have to stand there for hours waiting for someone to take your call? The parking program is outsourced to Joe’s Auto Parks, not exactly a bright light in the parking world. When Xerox was running the TAP service center, I and other regularly waited over an hour for customer support. There are no service standards for the call center, so you literally could have one or two people there taking calls while people either stand around or are charged the $25 fee because they couldn’t understand the machine. Make it possible to pay for the parking [daily] with something other than ‘phone’ [=smartphone??]. Not everyone has a smartphone. What about disabled parking, will that remain free? Make money, money. Make money, money, moneeeeey! Parking is supposed to be free. You have no proof that metro transit park and ride locations are used by anyone other than transit patrons!!! !